This snake nose has two eyes, two nostrils, and a simple inscribed mouth that is not visible on this photo. 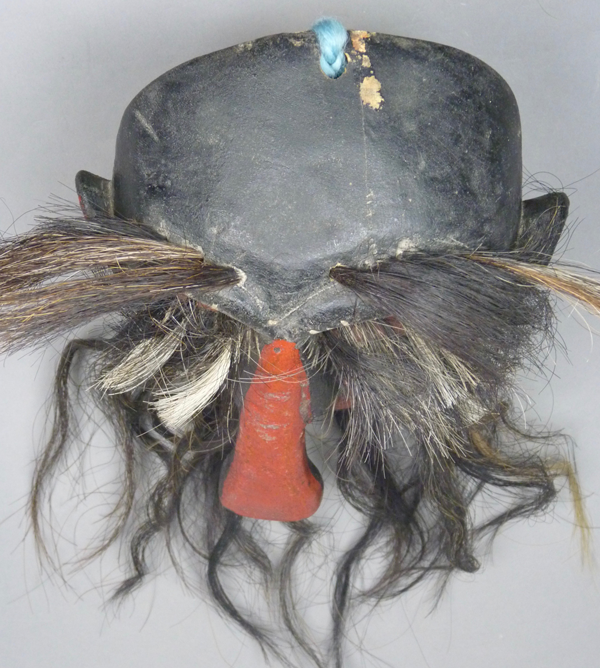 The brows, mustache, and beard are made from horse tail. 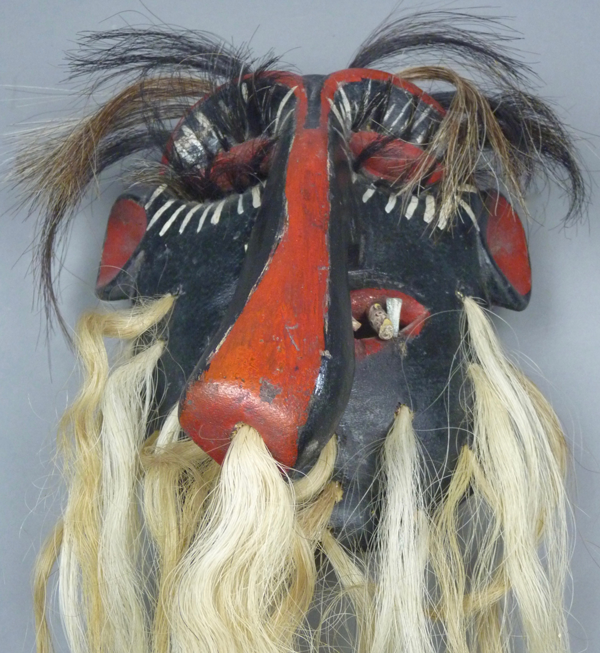 This mask is 11 inches tall, 8 inches wide, and 4 inches deep. The back reveals moderate staining from use. 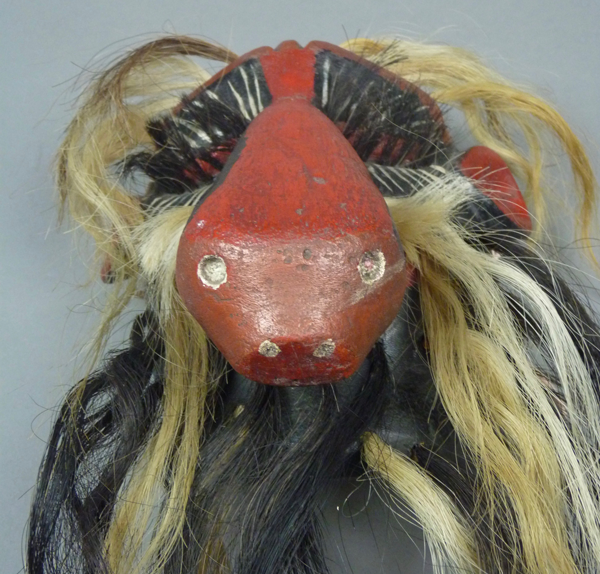 The second of these masks has a prominent nose, but that organ doesn’t have snake’s features. This nose is twisted to one side. 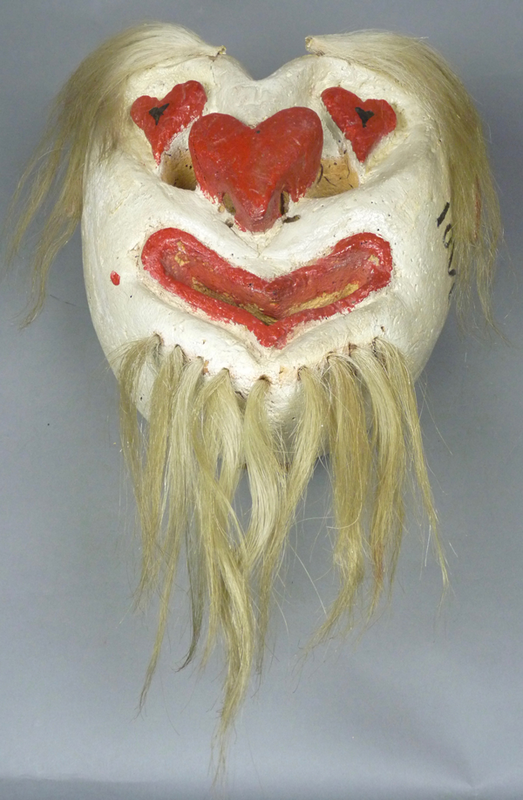 This mask and the last have prominent fangs. 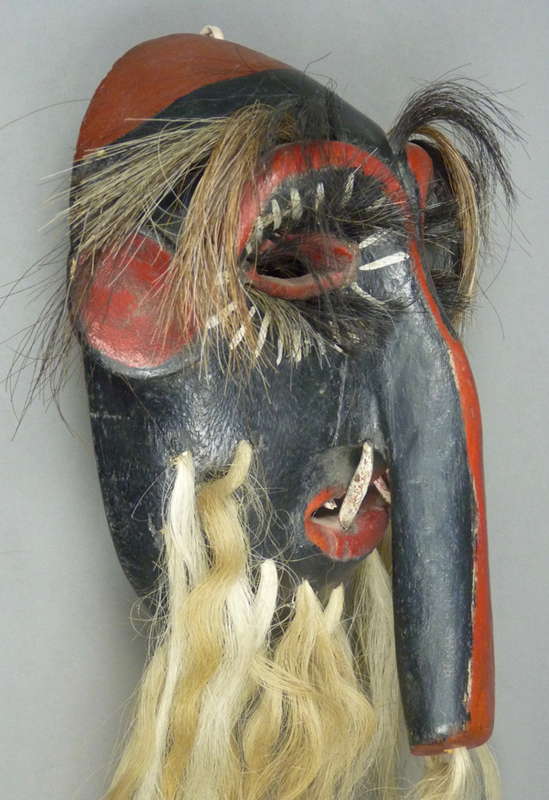 A section of tree trunk that bears a branch allows a carver to create masks with such noses. Some branches are straight while others are curved, leading to a variety of designs. 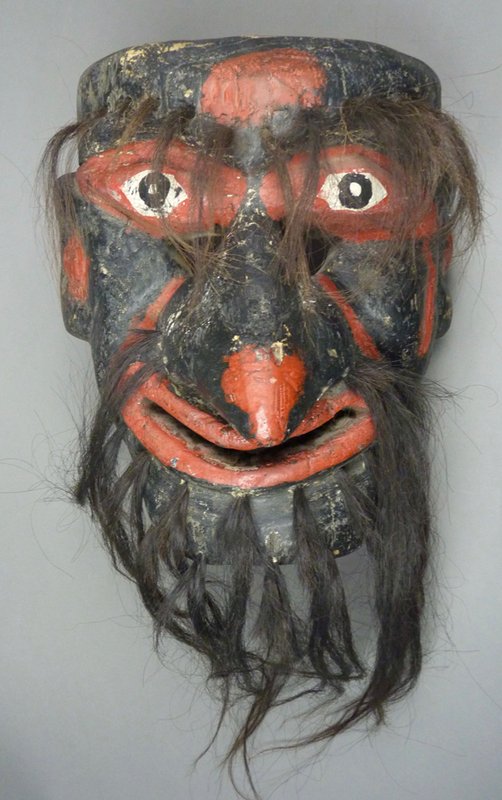 This mask is 9½ inches tall, 6¼ inches wide, and 3½ inches deep. The back shows some age. From this perspective, one realizes how crooked this mask is. 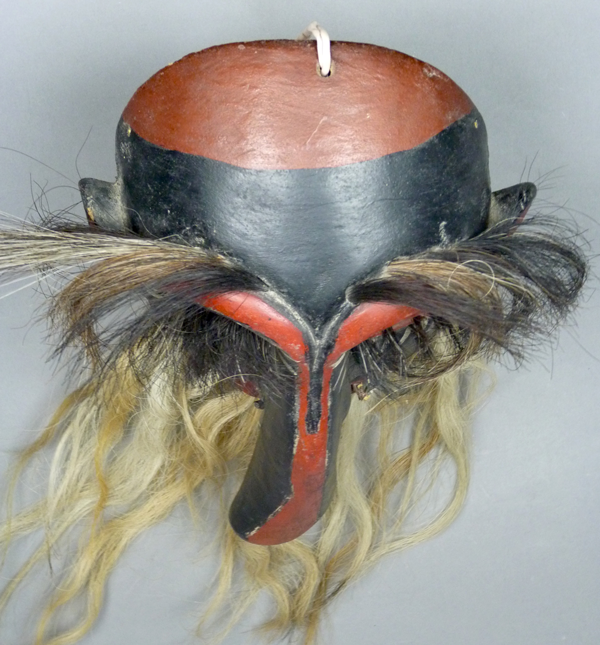 Here is the third mask from this group. It too has a snake nose, like the first. In attempting to photograph this mask head on, I have inadvertently responded to its asymmetry by shooting from a lateral angle. 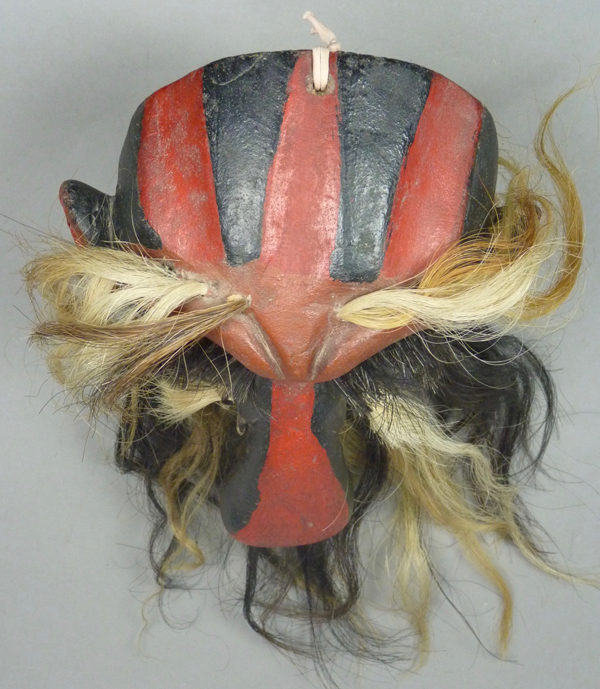 In fact this mask is unbalanced, and this will be more obvious in the brow view. Here is a really clear view of that snake nose. 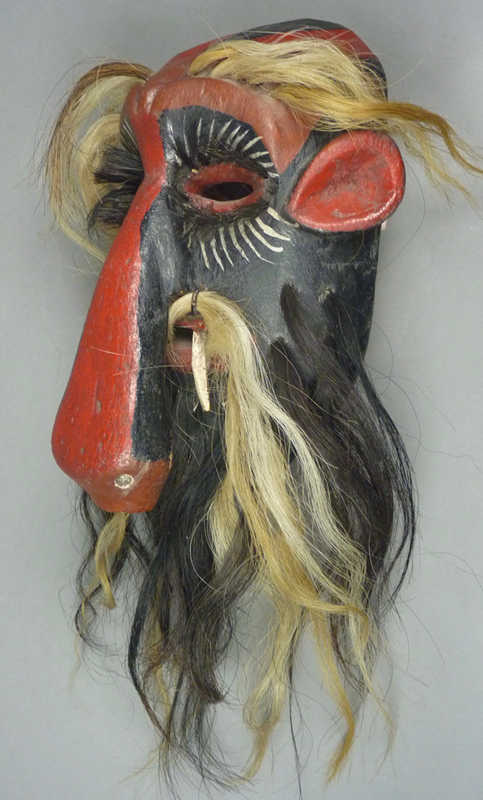 Do you experience this mask as obscene? 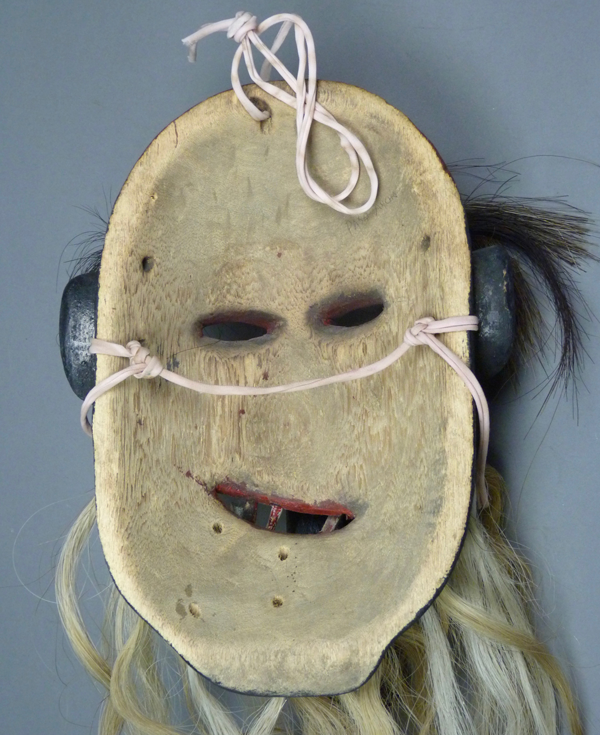 The blue yarn marks the center but the face is twisted to the side. 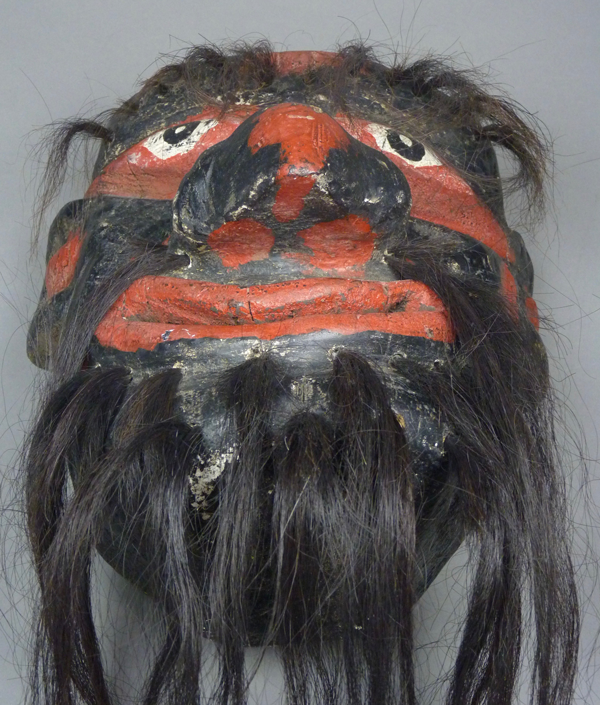 This mask is 11 inches tall, 7¾ inches wide, and 4½ inches deep. 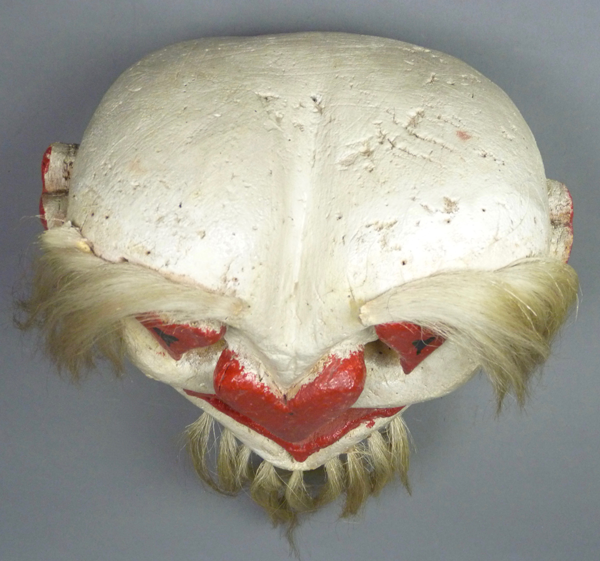 This too is a moderately worn mask. 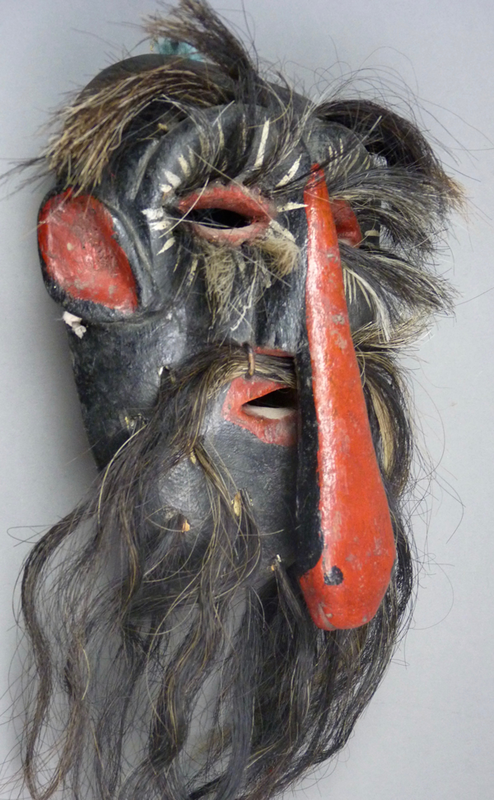 Now I will show two masks from a dance in Charo, Michoacán—the dance of El Viejo y el Toro. 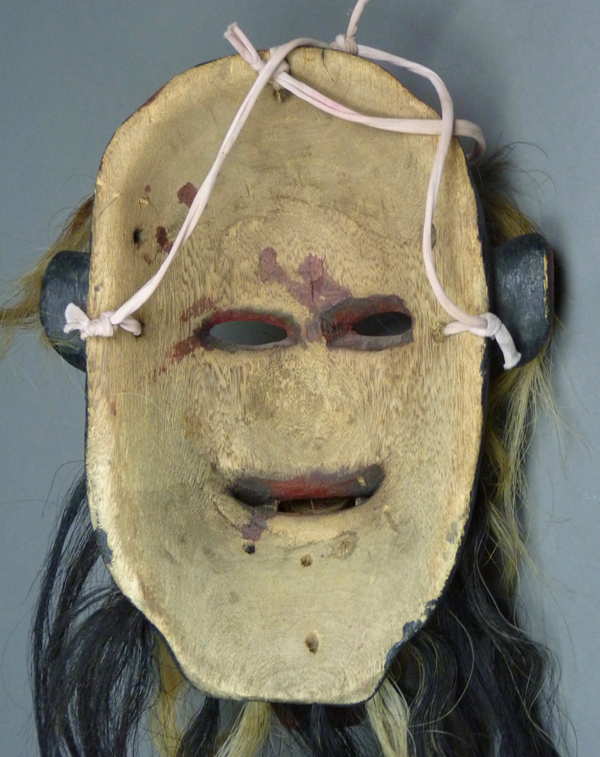 Here is a Viejo mask. 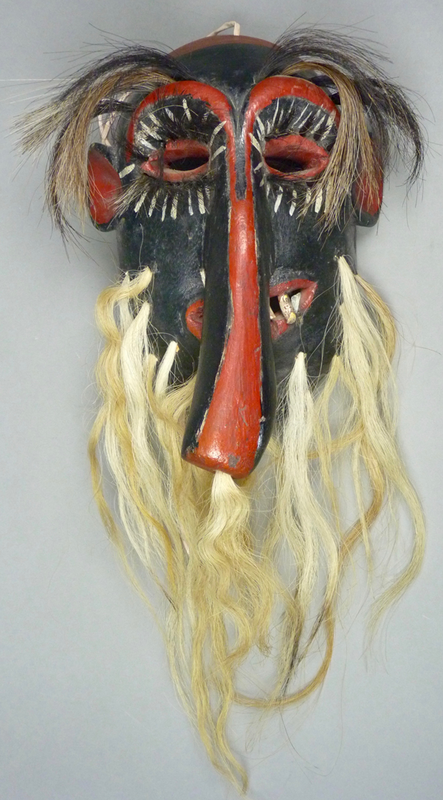 It is one of my favorite masks. 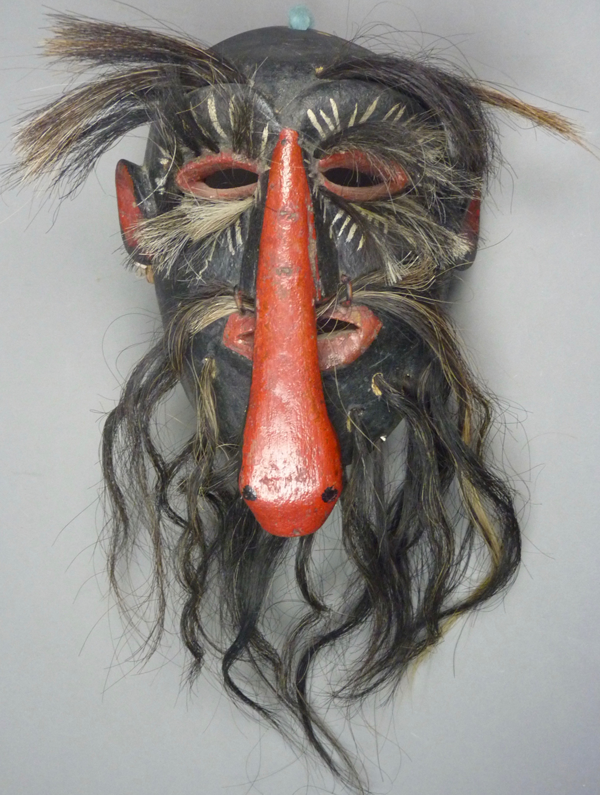 The dancer who wears this mask probably represents a Feo. The oversized nose is carefully shaped (and not like a snake). 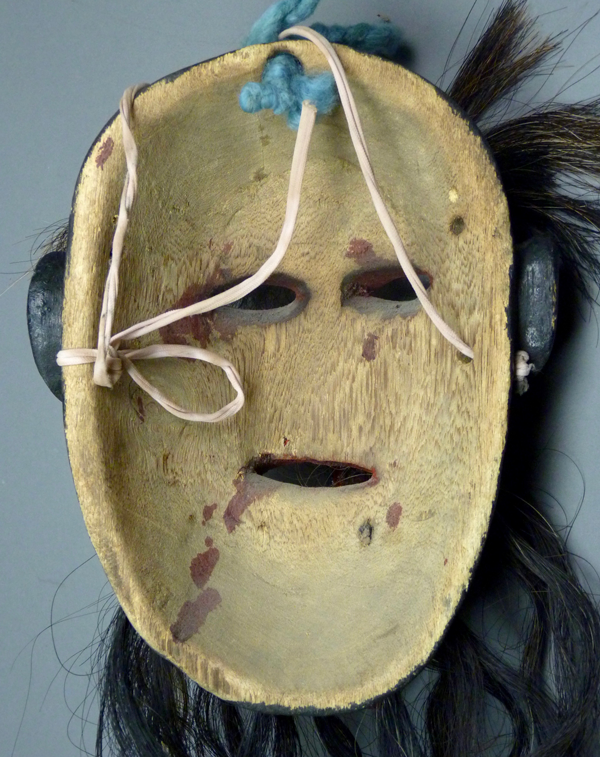 The top of this mask is large and flat. Just look at the shape of this bulbous nose from below. 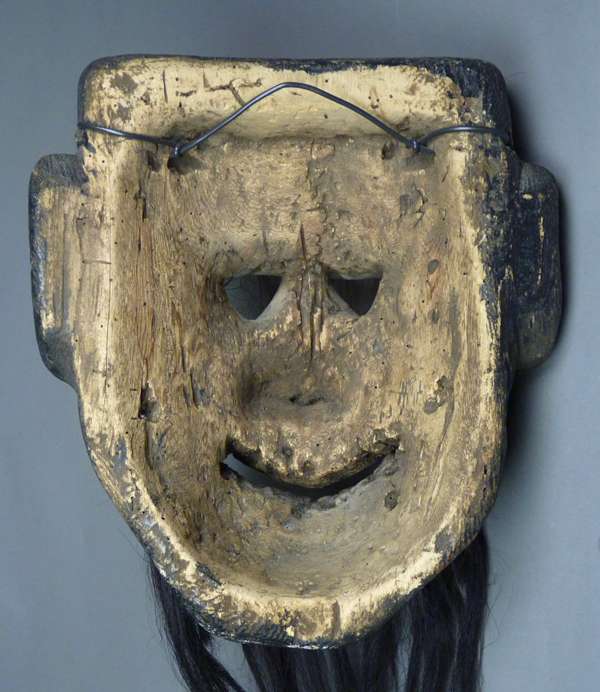 This mask is 12 inches tall, 10½ inches wide, and 6½ inches deep. This is an ancient back. I have a second mask from this dance (el Viejo y el Toro) that is even more striking, because it was designed around the theme of hearts. 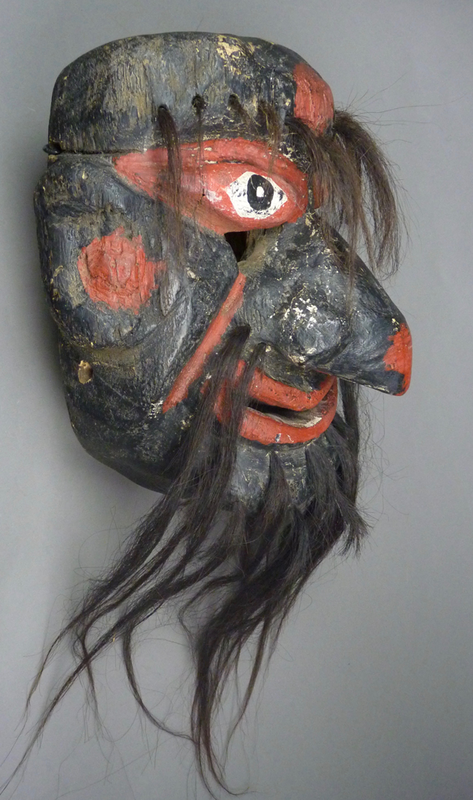 When I would visit Jaled Muyaes and Estela Ogazón at their home in Azcapotzalco (Mexico City), I would admire one of these masks on their living room wall, and I begged Jaled to sell me a duplicate if he had one. 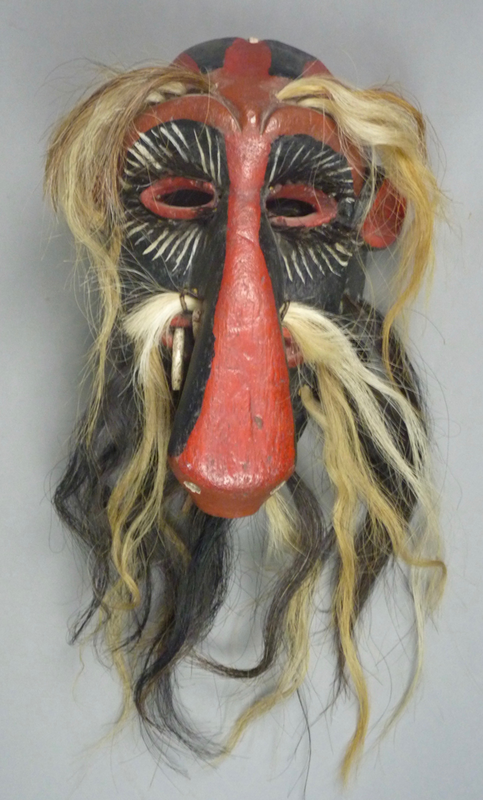 One day in January 2003, when I arrived he handed me this mask saying, “I had a third one of these” (he wanted to keep two of them, maybe because he had two daughters). Here is the third. 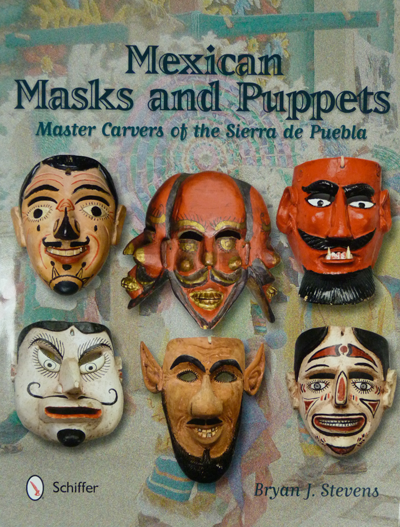 I am not aware of any photo of this style in a formal published book, but there is one in the February section of Agenda 1998, a printed calendar book that was circulated to friends and collectors by Jaled and Estela to promote a planned book about Mexican Masks from their collection. Alas, that grand survey never followed, because Jaled transferred his attention to the creation of art and sculpture (see my post of May 4, 2015). Later the family was able to enlist Jaled’s energy towards a more limited book, La Muerte en las Danzas Mexicana (2006). There is a photo in that book of a shrouded Death figure carrying a scythe during Carnaval in Charo; Death may have had a role in this Toro dance, as it definitely does in one from Silao, Guanajuato that we will examine in several weeks. 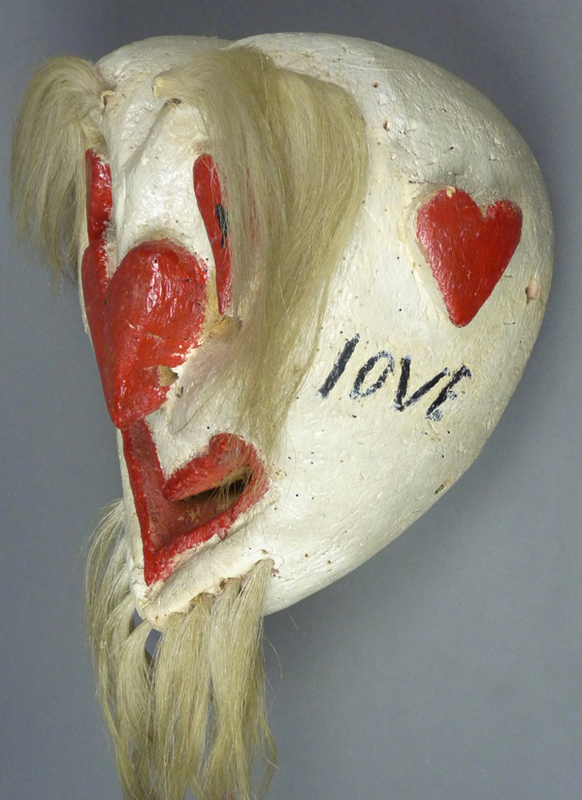 In any case, the caption in the Agenda for the mask with hearts reads—”Carnaval-los Viejos y el Toro/Charro, Mich/ 37×36 cms” (about 14″x14″). 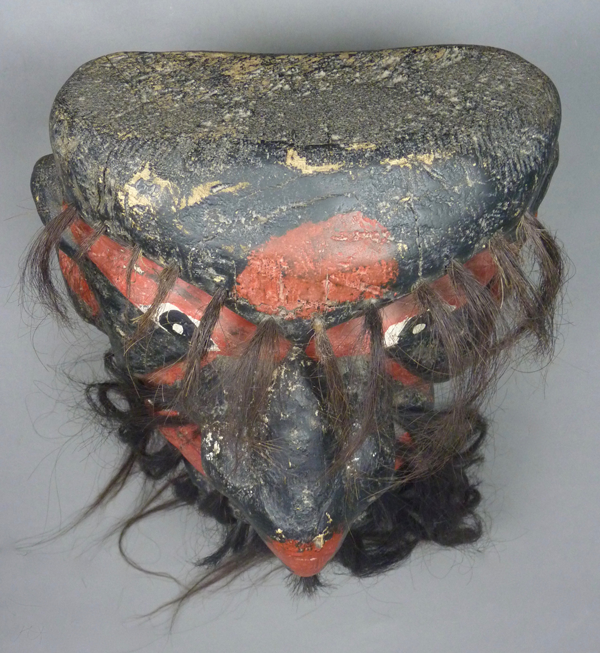 Either the heart-studded mask was used in both dances, or perhaps the Viejo and Toro dance was only performed during Carnival. As you will repeatedly see in these posts, the dances with feos tend to occur during Carnaval (Carnival or Mardi Gras), because during that fiesta the normal behavioral rules are suspended and the “ugly” behavior of the Feos is tolerated, even expected. The example in Agenda 1998 also has the word “love” on the left cheek. 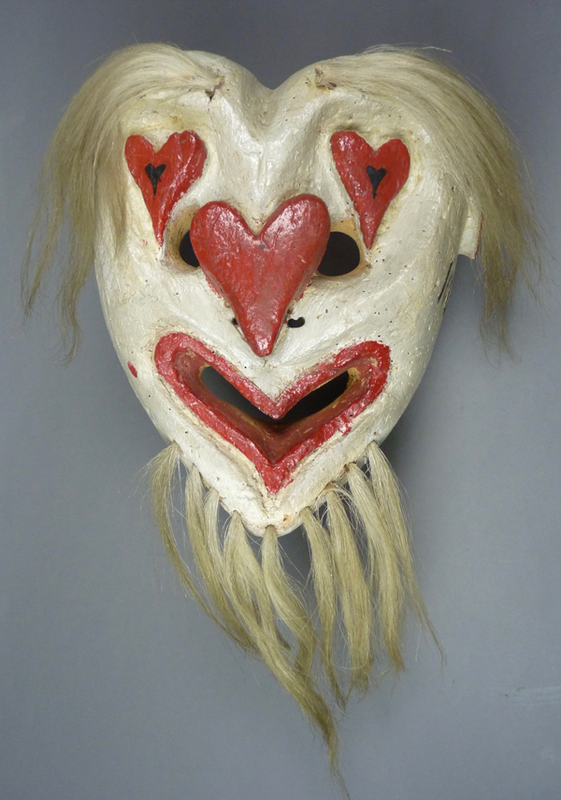 This mask (and the others) contains seven hearts. 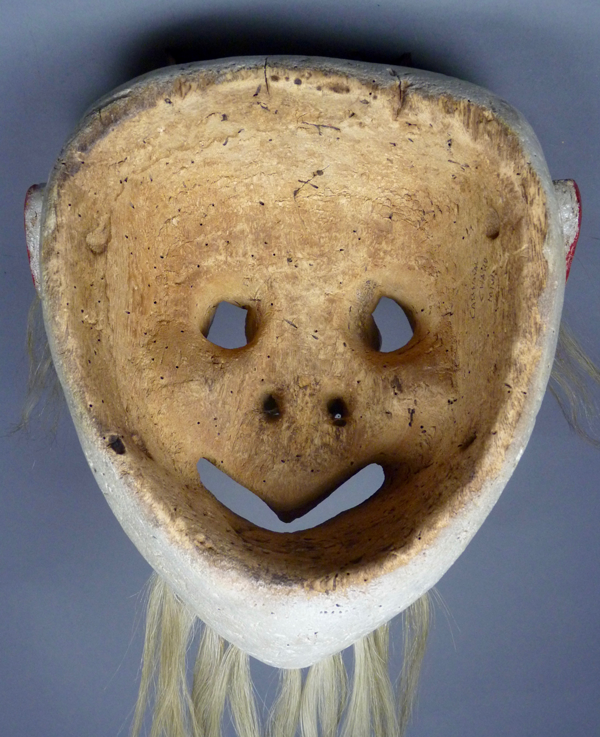 The top of the mask is cleft by a groove associated with the mask’s overall heart shape. 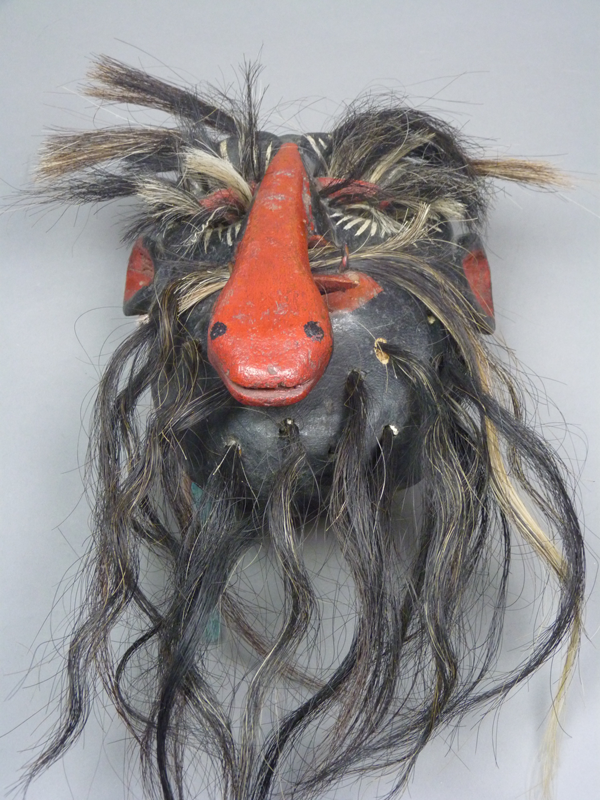 This mask is 11 inches tall, 11 inches wide, and 7 inches deep, so it is smaller than the one in the Agenda calendar. Next week I will show you three Carnival dogs from Cuanajo, Michoacán. You can message me directly at Maskdoc@gmail.com.